This 2007 Lincoln Town Car Executive l limo has an 8 cylinder 4.6 liter engine in it. This particular vehicle was in an accident with a pole, but does not appear to have any damage on it. The transmission is in great condition. This vehicle is run by regular gas. The inside of this limo is a black leather material. Behind each front seat is a pocket for either a map or important paper work. In the center of the back seat is an arm rest for some comfort. There is plenty of lighting inside this limo if you need to see at night. 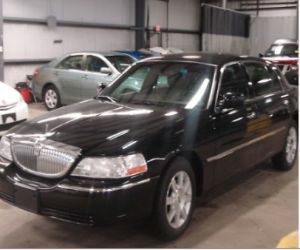 This 2007 Lincoln Town Car L Limo is black, with a silver stripe going all around the body. This vehicle had been in an accident but does not appear to have any damage to it. There is minimal to no scratches or dents.